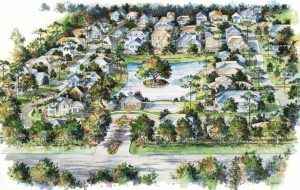 ST. AUGUSTINE BEACH, Fla. – McGarvey Residential Communities is developing Ocean Ridge, a new community in St. Augustine Beach that will reflect an enduring passion for conserving Florida’s incomparable natural resources. “For the past 18 years we have been known as a significant steward for preserving the distinctive beauty that lies in the splendor of St. Augustine Beach’s native features, while creating desirable neighborhoods. Ocean Ridge will be no exception,” said Jay McGarvey, president of McGarvey Residential Communities. McGarvey’s thoughtfully designed and heralded St. Augustine Beach communities include Sea Colony, Sea Grove, Anastasia Dunes and Beach Haven in Flagler County, all created by paying close attention to the built environment, respecting open space, maintaining the topography and lavishly landscaping with native plant material. Located on Anastasia Island at Mickler Road and 11th Street, Ocean Ridge will blend a Florida beach-style architecture in a one of a kind neig hborhood with lake views and a private swim club. All just blocks away from the beach. “From its inception, the original intent and design for the community was to create a unique, environmentally sensitive neighborhood. The three builders in the community share that vision for Ocean Ridge,” added McGarvey. Riverside Homes and SH Design are creating new floor plans and designs as well as offering semi-custom and custom homes for the pristine single-family home sites. Ocean Ridges’ tranquil scenery, oak canopy and hilly topography will create a unique combination, offering residents the benefits of treed lots and sea breezes while maintaining the innate beauty of one of the last planned communities in St. Augustine Beach. “As a company, we are dedicated to building communities that will be here for years to come, that both celebrate and maintain as much of the original character of the land as possible with graceful landscaped streets, native grasses and trees, and spaces to relax and gather,” said McGarvey Residential Communities’ chief financial officer and development partner Dinah Robertson. Since 1980, the focus of McGarvey Residential Communities has been to “build communities that last for generations.” As a result, they have developed some of the most enviable neighborhoods in North Florida. Now add Ocean Ridge to that prestigious list.